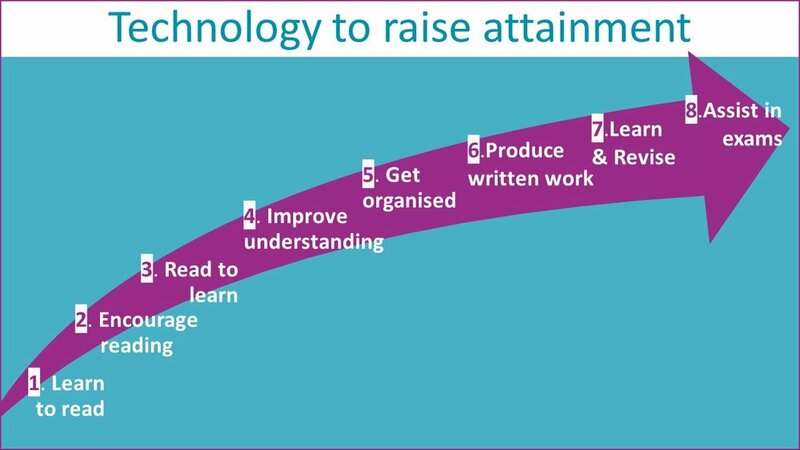 Once students are expected to read to learn and write to be assessed, the following solutions enable students to produce better quality work, thus empowering them to raise their grades. These solution are helpful for further & higher education, as well as the world of work. While every child must and will learn to read. For some, decoding is excruciatingly difficult and slow. Text to Speech (TTS) enables text to be read to students. This can be achieved for no charge at all by simply using the functionality that most families and schools already own. Learn how to switch this functionality on. Alternatively, there are a number of devices and apps that can be purchased to read text to students. These are priced between £10 and £120. This transformational functionality can be used in formal exams, even in circumstances where a human reader would not be allowed, for example in English comprehension papers, as it is classified as totally independent work. Surprisingly few school access this functionality. While many publishers now sell electronic versions of books. RNIB Bookshare enables any school to download electronic text books for any students that are print disabled free of charge. These are particularly useful for students that have difficulty taking comprehensive notes during lessons. Many children struggle to take good notes in class. Cognitively, note taking is a complex and demanding task. For some students, it is impossible to listen, understand and write all at the same time. Copying information from the board can be a particularly arduous task. Without good notes, students are at a disadvantage when competing homework or preparing for tests and examinations. However, there are many tech solutions that exist to help students take notes in class. This essential life skill is particularly important for dyslexics. There are many advantages of typing homework. It provides help with spellings and grammar, it allows easy reorganisation of text and it enables work to be proofread out aloud. Dyslexics often struggle to see the mistakes they make when writing, but they can hear them when text to speech is used to read their work back to them. Touch typing opens up extremely helpful functionality and prepares students for the world of work far more than handwriting. There are also great free and low priced solutions that teach touch typing. Free dictation software in now widely available. For those that find it beneficial, it is still worth investing in a paid solution for increased speed and accuracy. Many dyslexics struggle to be organised. Free apps provide reminders to prompt when tasks must be completed. Trackers save a lot of time by helping to find objects quickly. These are designed to assist with retrieval practise, helping students to recall and master information. They are particularly helpful when students struggle with poor working memory and no amount of rereading a topic will help it be recalled during a exam. Free solutions are available in each of these areas but all too often schools and parents don’t know they exist, so children struggle needlessly. This can negatively impact confidence, expectations and life opportunities. Achieve Now is currently creating a YouTube channel to provide How to videos. Sign up to our mailing list to be informed once we launch!